Edited by Kenneth R. Piña and Wayne L. Pines, with 19 chapters by contributing authors. Regulation of Promotion and Distribution – Wayne L. Pines, APCO Worldwide Inc. Managing an FDA Regulatory Crisis – William Vodra, Retired Partner, Arnold & Porter Kaye Scholer LLP, Washington, D.C. & Wayne L. Pines, APCO Worldwide Inc.
A Practical Guide to FDA’s Food and Drug Law and Regulation provides an introduction to the laws and regulations governing development, marketing, and sale of food, medical products, tobacco, and cosmetics. Structured to serve as a reference and as a teaching tool, each chapter builds sequentially from the last, while providing an accessible overview of the key topics relevant to practitioners of food and drug law and regulation. 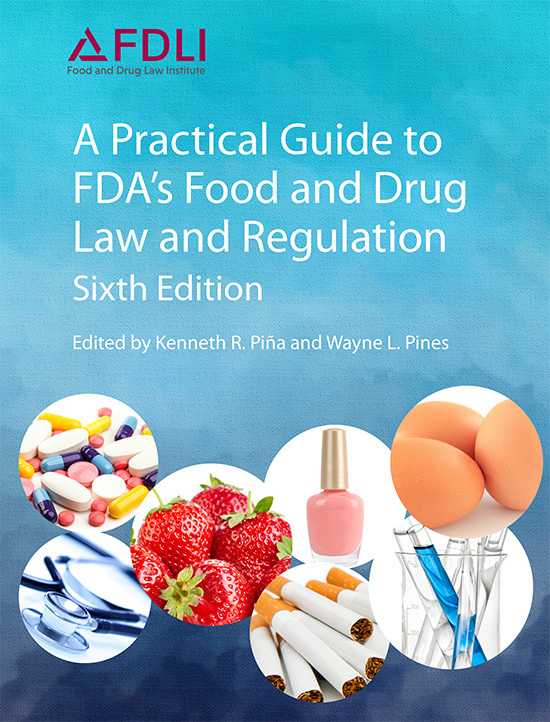 Written in real-world language, the book offers practical legal/regulatory fundamentals for use by a wide range of people interested in the FDA legal and regulatory scheme. This book is a standard text in law schools and graduate regulatory programs and has been cited as a reference in judicial opinions (including a U.S. Supreme Court opinion). This Sixth Edition incorporates the latest amendments to the Federal Food, Drug, and Cosmetic Act, as well as FDA regulations and guidances. It also incorporates important changes that have resulted from recent court opinions and administrative enforcement actions.